Product #6566 | SKU MMH-346 | 0.0 (no ratings yet) Thanks for your rating! The Hosa MMH-346 Quad Microphone Holder is an accessory that provides easy, organized access to four ball microphones on stage, in the church hall, or in the studio. Just grab a mic and solo whenever inspiration hits you; no need to go rummaging for a misplaced mic. When you're on stage, you won't have to worry about losing a mic in the heat of a performance. The MMH-346 keeps mics close by and visible. Up to four microphones fit in the rack, so each band mate or speaker has quick access to their own. The Four Mic Holder mounts on a typical microphone stand, giving you control over the height and placement of your mics. The simple interface also makes it universal and portable. All makes and models. Not compatible with straight column microphones, such as small condensers. 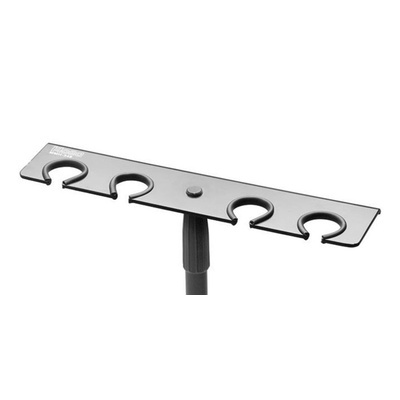 If you need to mount a variety of mic styles, buy the MMH-455 Four Microphone Holder (for Mic Clips) instead (here).